And determination to get a job done! Here at Horncastle recruitment we want to help find parents a job that can balance their home life. I have always been a working mum. I have two children and when they were very small i set myself up as a PR Consultant as I never wanted to work for an employer again - I had been involved in marketing for many large corporate companies for many years and had paid other consultants to work for the companies I was employed by and I realised i was doing the brief and being more creative than they were plus I was signing off their great part-time pay checks - which were more than I worked full time for! Read more. I had a wakeup call and realised this was something I could do part time - it was great work as it was flexible and well paid and I managed to find pretty local work for Property Developers. However, when the recession hit my contracts were both made redundant so my husband I diversified our trout farm to develop a Fish Smokehouse which was a great success and brought in that extra income lost from my work but we had invested heavily in the business and the workload was enormous and i felt i had lost all my life/work balance. It was around this time when I came across a network marketing business that looked almost too good to be true - flexible, low risk, great compensation plan and unique products, I was really sceptical but I decided to give it a go. It is now almost 4 years on from starting that business and it has totally changed our lives as a family, the products transformed my husband's health and the business side has proved to be everything it said on the tin - flexible and fun. I know that if i put the work in then my business will expand and so will my monthly bonus, so in actual fact I decide when I want to earn more money - I just do some more work! I still find it hard to believe that from a business that I thought might earn me extra £1000 per month it is now paying me over £4500 per month plus I get a car and two all expenses paid holidays each year - and an annual profit share cheque - as I am still only working part-time! I think it is great for women to work and for their children to see them as working mum's it sets a great work ethos in the household and makes a mother more respected and it means the whole family are responsible for household tasks as everyone is busy and so everyone has to muck in! Returning to work after having children or for the first time with children can be very daunting. There is so much to think about and plan never mind the heartache of having to leave your little one. We have put together a directory of tried and tested local nurseries that we ourselves would put our children into it and will add more as we feel appropriate. Bearhugs Horncastle is a 49 place day nursery catering for children from 6 weeks to 11 years. The nursery is divided into baby bears (0- confident walkers), Tweenie Bears (Confident walkers -2) , Little Bears (2-3), Big Bears (3-5) and Wise Bears (4-11). We offer afterschool provision from Horncastle primary school via a walking pick up. Each room is carefully planned to meet all the individual needs of the children. We have a qualified and experienced team who are a mix of ages and most of whom are mummy’s themselves so they fully understand how hard it is returning to work. Bearhugs Tattershall follows the same ethos as our Horncastle nursery but is slightly smaller and is within a purpose designed house. Bearhugs Tattershall can have up to 40 children at any one time. We also offer breakfast club and afterschool pick ups from the local Holy Trinity Primary School Tattershall. 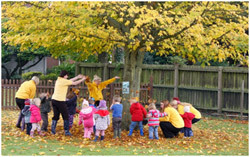 We provid highly qualified staff across our whole nursery, most of whom are parents themselves, who are on hand to support and guide and ensure children settle as quickly as possible into their new environment and you feel reassured with their learning and care. Fees and discounts are the same both of our nurseys. The primary aim at Woodlands Nursery is that every child should be encouraged to develop as an individual in order to reach their full potential. We work closely alongside parents to ensure their needs and requirements are met and their child is settled, happy and safe. Our homely environment is inviting and staff are caring, supportive and passionate with their wealth of experience in caring for young children.